If pushing it to your limits is your M.O., it might be high time for you to back off a bit and deload. By following the "I don't need no stinkin' break" approach to lifting, many lifters don't make room in their program for deloading. That's a shame because ratcheting back from your max workout can do your body a world of good. Many lifters organize their workouts based on the principle of overloading, in which you add more and more challenges over time. These challenges can come in the form of progressively more weight, more volume, or less rest. It's an effective technique but it can torch your body if you don't occasionally slow down. A deload is a period of time, usually about a week, when you back off the intensity of your workout after a long phase of overloading. People often do it when they reach—and can't overcome—a persistent state of fatigue. Why Slow Down? I'm Doing Great! Many people think that taking the time to deload will shift their gains into reverse. I mean, why work so hard each day only to let your intensity slide? You'll just lose strength, right? In fact, it's precisely because you’ve been working so hard that you need to deload. Deloading doesn't mean you're stopping. It usually means switching to weights that are about half what you normally lift and cutting your volume in half. It'll make your workout feel incredibly easy, but that's the point. The human body can take only so much stress. Without a break in intensity, you’ll burn yourself out, fatigue your body beyond its ability to recover, become injured, or all three. Think of deloading as proactive damage control. By making it a regular part of your training program, you can keep progressing—without having to take much longer breaks when your body gives out. Deloading gives your joints and tendons a chance to heal and your muscles time to fully recover. This will strengthen your body and mind over time. Constantly pushing 100 percent each workout can be psychologically taxing. You might think you are tough and can take it, but this is exactly how burnout takes place. During your deload period, add some light to moderate cardio training to your workout. Avoid high intensity training (HIT) or you’ll be swapping one form of strenuous exercise for another. Cardio, done in moderation, helps the recovery process by improving blood circulation to bring more nutrients and oxygen to damaged muscle tissues. It’s also a great way to relieve soreness. Aim for 20-30 minutes of light cardio training 3-4 times during your week of deloading. Since you'll be lifting much lighter weights during this period, use the opportunity to focus on form. Correct any bad habits you notice so you can see better results and avoid injury once you get back to your normal workout. Also use this time to work on developing a stronger mind-muscle connection. If you're doing triceps pull-downs, focus on your triceps and make sure they're doing the work and not your abs. If you're doing back exercises, tune in to your scapula and keep your arms out of it. Deloading is also a good time to integrate some new exercises into your program. 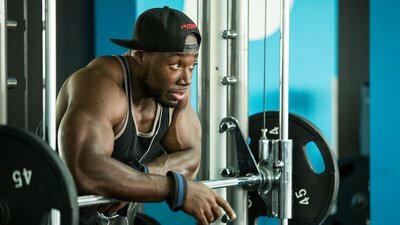 Once you finish the deload, you'll get back to your regular program and there's no better way to ensure continued progress than to keep switching up your exercises. Adding new exercises can cause soreness, so start out with light weights. You don't want to deal with delayed-onset muscle soreness (DOMS) while you're deloading—or any other time, for that matter. The deload period is a chance for your muscles to recover, not get damaged. Take it easy and give your body time to learn new movement patterns. Because a deload week is pretty easy, you're able to combine a few workouts into one, to the point where you can probably do a full-body run-through in an hour or so. This will help you cut back your weekly gym schedule from five days to maybe two days, freeing up big chunks of time for recovery—and for sleep. Use these extra hours to take naps instead of hitting the gym, or just go to bed earlier. Sleep is when the body heals itself; the more sleep you get during this week, the more effective your deload will be and the stronger you'll feel when you get back to your program. Too many of us try to get by on as little sleep as possible. This does your training no favors. Consider eight hours a night an effective minimum to strive for. Deloading isn't the time to slash carbs. Many people think that since they're lowering their training intensity they need to lower their calorie and carb intake too, but don't be so sure. The purpose of a deload is to help your body recover from intense, challenging physical activity. As you ratchet back your workout, make sure your body is getting all the carbs it needs to restore muscle glycogen and rebuild lean muscle mass tissue. It might make sense to decrease your carb intake slightly if you were doing a high-volume workout right before you deload. If that's the case, don't decrease your carbs too much or your results will suffer. The period of deloading might seem like a radical shift from your regular routine, but it's only for a week or so—just long enough to give your body a chance to gather its strength again before you start piling on the plates. Connolly, D. A., Sayers, S. E., & McHugh, M. P. (2003). Treatment and prevention of delayed onset muscle soreness. The Journal of Strength & Conditioning Research, 17(1), 197-208.